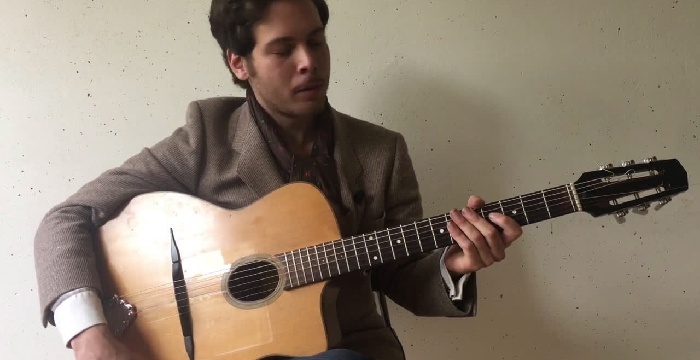 The colors and techniques that distinguished Django Reinhardt’s early guitar style. Close your eyes, listen to Duved play, and you’ll swear it was a 1930s Django Reinhardt recording. He’s one of the most authentic-sounding players in the style today. Now, for the first time, he shares his secrets. 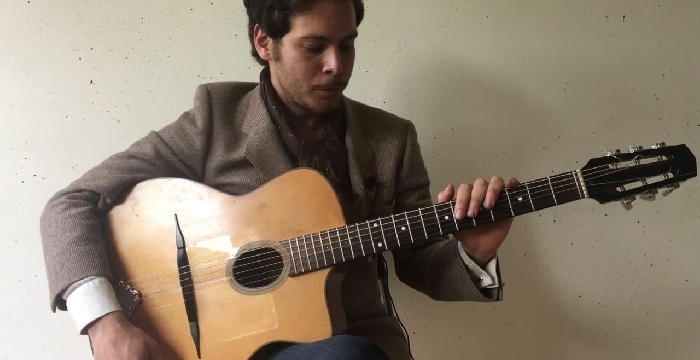 In this course for gypsy-jazz guitarists, you’ll learn what makes Django sound like Django. It’s a combination of many things, including: the “juicy” notes to focus on, the phrasing, and the specific guitar techniques such as bends/slides/vibrato. This is more than teaching a bunch of licks — it’s an analysis of the underlying concepts. The course is divided into two parts. First, Duved focuses on the colors, techniques and ideas of 1930s Django — providing many playing examples along the way. Finally, Duved performs eight tunes in the style, improvising using the ideas he discussed in the first half. Everything Duved plays — the lessons and performances — is transcribed in tablature and standard notation, so you can follow along clearly and learn as efficiently and effectively as possible. Slow down the video without changing pitch, and drag your cursor across the notation to loop sections you want to practice. You might be wondering: why is this course explicitly about 1930s Django, as opposed to Django in general? It’s because Django was active from the 1930s to the 1950s, and his style changed over time. This course focuses specifically on his early period, the 1930s, when he played acoustic guitar in the Quintette du Hot Club de France. 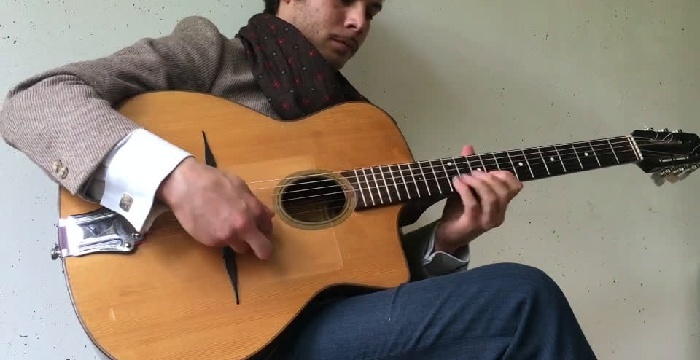 You’ll get the most out of this course if you have at least basic experience playing gypsy jazz. If you’re intrigued by Django but have never played in this style, you’ll likely still get a lot out of it, as long as you have some basic jazz background (e.g., you know what a ii-V-I is). This course is not for beginner guitarists. Duved has spent 10 years studying the details of Django’s playing, and he’s distilled his learning here for you, at a price that’s even less than a private lesson — and, in several ways, better! We hope you love it. Rhythm guitar: Nick Sansone. Produced by Nick Sansone and Adrian Holovaty. 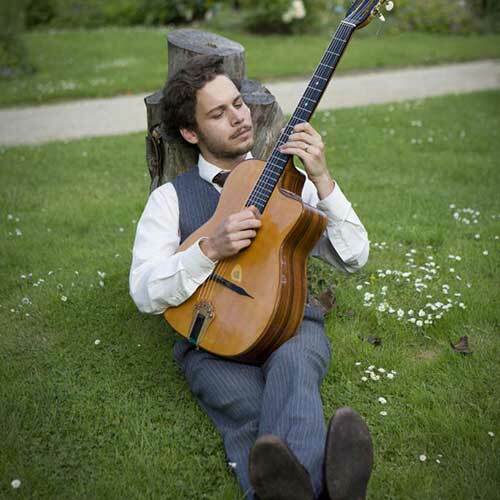 Duved Dunayevsky is one of the most authentic-sounding guitarists in today’s gypsy jazz scene. He focuses on swing music, in the 1930s style of Django Reinhardt and Eddie Lang. His Paris-based band, Duved’s Pre Bop Orchestra, plays original tunes in the style. See more on YouTube.